Let me start with a confession. I am one of those people who cries when I watch horse movies like Seabiscuit or Secretariat. I am touched by the powerful storylines that show how those horses realized their full potential because they ended up in the hands of the right trainers and owners. How many horses (and other animals) end up in the hands of the wrong people on this Earth? Likewise, how many people end up in the hands of the wrong leaders? Just as horse whisperers create environments for horses to be champions, good leaders also create environments for people to be champions. This is why horse whispering leadership lessons are invaluable. Leaders can transform their ability to build trust and engage employees by learning the secrets of horse whisperers. I heard about horse whisperers when I was growing up in a ranching community – special people with the gift of joining a horse’s world and transforming it into a trusting and loyal companion. But the cowboys and horse trainers I knew led with authority demonstrated by force. They used force and fear to get their horses to move, stop and turn. They appeared to get their horses to do what they needed, which seemed okay at the time. I now know that a horse performing under that type of pressure can bolt in a split second, harming itself, the rider and anything in its path. It wasn’t until my husband started studying natural horsemanship as part of our leadership coaching that I got a front-row seat to the magic of horse whisperers. I came to understand the keys to getting a horse to willingly follow its leader with precision, poise and purpose. 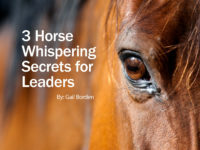 There are three things people can learn from horse whispering leadership strategies that will transform their thinking and abilities. A horse whisperer knows that trust is the foundation of everything. That is why he observes, listens and figures out what the horse needs to feel safe. Safety is the horse’s first priority. The average horse weighs about 1200 pounds and it sits atop four very long and vulnerable legs. A broken leg will almost certainly lead to death. Horses are prey animals, so they naturally fear people, who are predator animals. The horse’s natural instinct is to protect itself from humans. A horse whisperer accepts that safety is the horse’s primary criteria and knows that each action and nonverbal cue will either erode or build trust. “The horse senses when a rider’s mind is clean and centered,” says horse whisperer and leadership consultant, Jerilyn Caldwell. “Humans are constantly sending sensory signals that tell a horse whether it is safe or if it should flee,” she adds. “Just like people, a horse that feels safe is relaxed and teachable.” Jerilyn has trained thousands of horses and riders during her career. She works with abused horses that have never trusted a human and with highly talented horses and leaders that want to explore their full potential. To earn the horse’s trust, the horse whisperer starts with small things to introduce pressure so the horse can learn to make decisions to relieve the pressure. Some pressure is necessary for learning, but too much can backfire. Over time, the whisperer creates all sorts of trials where the horse learns to trust and stay resourceful no matter the circumstances. “Without trust, the horse can never reach its full potential. With trust, the horse is transformed into a true and loyal partner,” says Jerilyn. Likewise, employees are free to be their best when leaders create an environment of trust where they are safe to flourish. As with horses, people gauge the trustworthiness of leaders by the consistency and congruence of their actions and communications. When leaders fail to clearly communicate, they impact trust levels. When people are in a work environment where they are looking over their shoulders and second-guessing their leader’s intentions, they are not free to be their best. The most effective leaders clearly communicate that they have their employees’ backs – through the good times when things are going great and through bad times when mistakes are made. Just as horses that don’t trust will flee, people who don’t trust leaders will flee, disengage, hide their mistakes, withhold valuable information or blame others. A horse whisperer thinks from the horse’s perspective. He sees the world through the horse’s eyes, which are located on each side of its head. Horses have amazing peripheral vision, but because of the location of their eyes they have a sort of trifocal affect that impacts their depth perception. For instance, things on the ground can look blurry to them and they do not see a water puddle the same way a human sees it. If you reach your hand up quickly to pet a horse’s head, it could mistake that motion as a threat. A whisperer understands the horse’s point of view as he teaches the horse to cross streams, climb mountains and maneuver new or strange territories. “The horse becomes a mirror of yourself,” according to Jerilyn. “The horse senses when you have its best interests and perspective in mind. It reads the intent of your perspective, just as people do with their leaders,” she adds. Some of the best leaders we have coached with Fortune 500 groups are those who are able to think and communicate from multiple perspectives. They are able to pace the reality of their people, so they gain permission to be heard and lead their people to other realities. One of my favorite communication presuppositions is that once you accept the other person’s reality, everything becomes easier. Once employees know you understand their reality, they are much more willing to follow your lead. If they think you are clueless about their perspectives and realities, they will resist, disengage or leave. Again, it all goes back to trust and communication. A horse’s nonverbal acuity is amazingly accurate, so a horse whisperer must also score very high in nonverbal acuity. He knows that the horse is reading every microscopic movement to gauge his safety. “The horse is paying attention to everything you are projecting,” says Jerilyn. “If you make a move that signals danger, they release adrenaline. If you make a move that signals safety, they relax, listen and follow your instructions,” she adds. “In that relaxed zone, the horse is at his best and is very capable of doing amazing things.” Through your nonverbal cues, the horse senses if you are fearful or confident. If you are asking a horse to cross a stream, he senses the slightest tenseness in your legs, your heartbeat and breathing, how you are holding the reigns and more. If your nonverbals communicate tenseness in that type of situation, you are communicating your own doubts to the horse and he is not going to easily cross the stream. Likewise, people are constantly reading a leader’s nonverbal cues and congruence. Nonverbal communication accounts for the majority of the meaning of a leader’s communication. The nonverbals tell people if a leader is congruent, confident and consistent. Research shows that if a leader’s nonverbal cues are in conflict with his words, people will believe the nonverbals over the verbal. Once a leader gains a reputation for not speaking truth or not believing in what he says, it becomes difficult for people to trust that leader. Horse whispering is about leading with all of your senses. It is about clearing out your thinking and being a keen observer, so you can be a more effective leader and inspire your people to move toward a better future. The horse is a very powerful teacher, because the results do not lie. When you look into the horse’s eyes, you will see yourself. You will see the leader that others see. Could you be interested in learning the secrets of horse whisperers to improve your leadership capabilities? Then, Contact Us today. Gail lives on a Texas ranch with five amazing horses, one very cute donkey and an entertaining bunch of dogs, cats and chickens! We support local animal shelters that rescue abandoned dogs and cats. Benchmark has consulted with and trained leaders and associates from all 50 USA states and more than 25 countries. The Benchmark team provides award-winning leadership and communication strategies to Fortune 500 groups so they can achieve their business goals. We provide consulting and coaching services in: leadership development, soft skills, reputation management, crisis response, media skills, stakeholder engagement, effective communications and storytelling / presentations.